Shining a little light on the pathways around your home can be a homerun all around--not only are you illuminating the walkways or driveways for safer use after sunset, but you're also adding to the after-dark curb appeal of your property. For pathway lighting, a low-voltage light system is recommended. Easy to install and safe to work with, these systems utilize flexible, easy-to-lay cable and offer a wide choice of fixture and lamp styles to suit a variety of lighting needs and designs. They also require the use of a transformer to convert house line voltage to the 12 volts needed for the fixtures. This is about the same voltage used in a car battery or a child's train set and is safe for do-it-yourselfers, with little or no risk of shock. To further ensure safety, the transformer must be plugged directly into a ground-fault circuit interrupter outlet or a receptacle that is protected by a ground-fault breaker. A timer, photocell, motion sensor, or a remote control can control the lights. A low-voltage light system can be bought as a kit that includes the light fixtures, cable and connectors, transformer, and any other necessary parts. For those who want to build a custom kit, you can buy everything individually, but be sure the components are waterproof and intended for low-voltage, outdoor use. Most low-voltage systems are designed to work with low-voltage cable extending no farther than 200 feet from the transformer. What this could mean to you is that rather than having a single 300-foot-long run (150 feet down and 150 feet back), you should plan for two 150-foot-long runs. As the electricity travels farther away from the transformer to remote parts of the property , electrical energy is lost due to resistance from the cable. Voltage drop can be minimized by switching to a more powerful transformer or by using a heavier gauge of cable, or both. As a rule of thumb, 16-gauge, low-voltage cable is recommended for runs up to 100 feet long, 14-gauge for those up to 150 feet, and 12-gauge for paths up to 200 feet long. Transformers range from lower wattage units that can power a single entrance light to large models that can safely operate 25 or more fixtures. To determine the transformer you need, simply add up the wattage of all the fixtures/lamps you plan to use (low-voltage pathway lights are usually 4, 7, or 11 watts each.) This total wattage is referred to as total nominal wattage or TNW. It also may be listed as volt-amperes (VA) rating, which indicates the maximum rate of wattage with which the transformer can be used. Once the TNW is established, select a transformer that most closely matches it. For example, to power six 11-watt lamps, you'll need a transformer that has an output of at least 66 TNW. As a general rule, the total wattage should not be less than half of the transformer's TNW, nor should it exceed the transformer's maximum capacity (80 percent of its maximum capacity is better). Using fewer lamps and less total wattage causes more electricity to go to each lamp, shortening the bulb life, but overloading the transformer will cause the ground-fault circuit breaker to trip or the dimming of all lights below appropriate levels. The instructions below cover the installation of low-voltage cable and light fixtures for pathway lighting. Use them as a guide while following the specific instructions and wiring connections that accompany your light kit or the separate components. If the transformer is rated for outdoor use, you can hang it outdoors, on a wall at least 1 foot off the ground or on an interior wall near the outdoors (Fig. 1). If the transformer is rated for burial, you can install it on the ground or beneath the ground. The line side of the transformer plugs into a standard voltage outlet that must be protected by a ground-fault circuit interrupter. Following the manufacturer's instructions, attach the load side cable to the transformer. Make sure the cable is long enough to reach the end of the run for which you intend it. Then lay the cable out along the pathway, leaving a little slack at each intended fixture location, in case you want to move the fixture a bit (Fig. 2). The cable can be hidden later as explained in Step 5. If you need to cross under a section of slate walkway, use a shovel as a lever to lift the slate and push it aside a few inches. 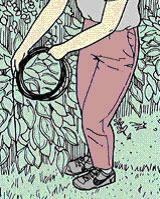 Then use a hand trowel to dig a trench a few inches deep, lay the cable in it, replace the soil, and replace the slate. Once the cable is strung out, assemble the fixtures and determine how they must be connected to the cable for electrical power as per the manufacturer's instructions. Typical wire splices will work with any system, but some fixtures have special easy-to-install connectors that pierce the outer shell of the cable and makes contact with the power wire--no splicing needed (Fig. 3). No matter what device is used, refer to the manufacturer's instructions for guidance. 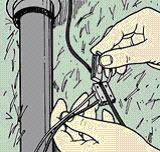 Once each fixture is connected to the cable, set it into the ground as per manufacturer's instructions. If the fixture has a stake, push it into the ground (Fig. 4). (Do not hammer it in; you might break it.) If there is no stake and the fixture requires placement in the ground, use a shovel or hand trowel to dig a hole large enough to comfortably accept the fixture. (Depth should match manufacturer's instructions.) Insert the fixture, and then backfill to surface level. If you want to bury the cable, dig a shallow trench deep enough to accept the cable, lay the cable into the trench, and backfill to surface level. 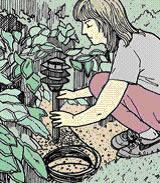 However, if the cable might be damaged by other gardening jobs (mowing, weeding, replanting), you should bury it deeper. Once all fixtures are connected and installed, plug in the transformer and turn it on to make sure all connections are in order and all lamps light up. If necessary, adjust one or more fixtures to perfect the lay of the pathway.